To AubRih, the shark is a significant symbol. Earlier this week, NYC tattoo artist Bang Bang shared a picture of his latest piece for Rihanna: a small camo shark on her ankle. 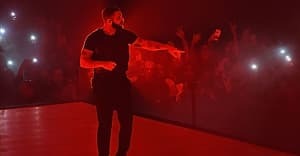 Fans speculated that it had some connection to Drake, as the tattoo looked like the stuffed shark he gifted her from Ripley's Aquarium of Canada. The shark plush also appeared in a post-VMA picture of the couple. Some adept fans noticed that Drake got a matching tattoo with Rihanna of the same shark. As Complex points out, pictures from Drake's Summer Sixteen tour show in New Orleans reveal the shark on his arm. AubRih fans rejoice — matching tattoos might mean their romance is real.